I just finished this wonderful novel by Tara Taylor and Lorna Schultz Nicholson. Through Indigo’s Eyes is a story of a 17-year-old girl named Indigo who has visions and is visited by the deceased, but who just wants to be an average teenager. The book is incredibly well-written: although not every reader is clairvoyant like Indie, every reader will identify with the journey of discovery this young woman makes. Her evolving dynamic with a long-standing friend, her exploration of self in relation to her first romantic interest, her concerns about life after high school, and her desire to find herself independent of (yet in context with) her family will resonate personally with readers. This book handles teenage situations in a way that is overall upbeat and positive, yet is realistic and validating to adolescents. Now that’s saying something, because it does not at all read like a fairy tale, and it deals with multiple pretty tough topics. I was impressed with how a teenager reading this would feel understood, validated, and is provided with alternative ways of looking at such situations that is open-hearted, open-minded, and lays a foundation for personal strength of character. We need more books like these, and I am donating my copy to the local high school library. Thank you so much for your lovely words! I’m so glad I touched you with my writing. I write to make people think and react and talk about the story as it relates to their lives. The donation to the high school is a bonus as well. I appreciate your reply! Keep doing what you’re doing–you make a difference. 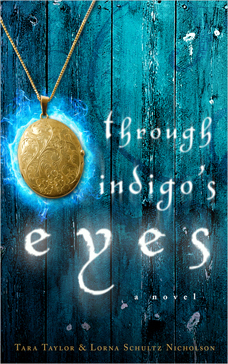 Thank you Gina for such a beautiful review of Through Indigo’s Eyes! I really loved how you said it was refreshing to read a story that treats intuition with respect and normalcy because that has been my mission the last 10 years to show that intuition is part of who we are as beings:) and that is what Lorna and I really wanted to get across in the book. I appreciate your reply as well! Please continue what you do, as you make the world better!